Finding the right funding is the foundation for getting your Mason childcare franchise up and running. In order to make that passion for Mason childcare and your own All About Kids location real, you have to find the right funding for the dream. Without the right funding, your opportunities may not be accessible and you never want to get into a business deal without the appropriate funding or support as you may be promising yourself failure. We want you to see our franchisees succeed and grow with their surrounding communities and families. There’s no need to run out of funds early and have to back peddle or drop out if you never make it to the return of investment. 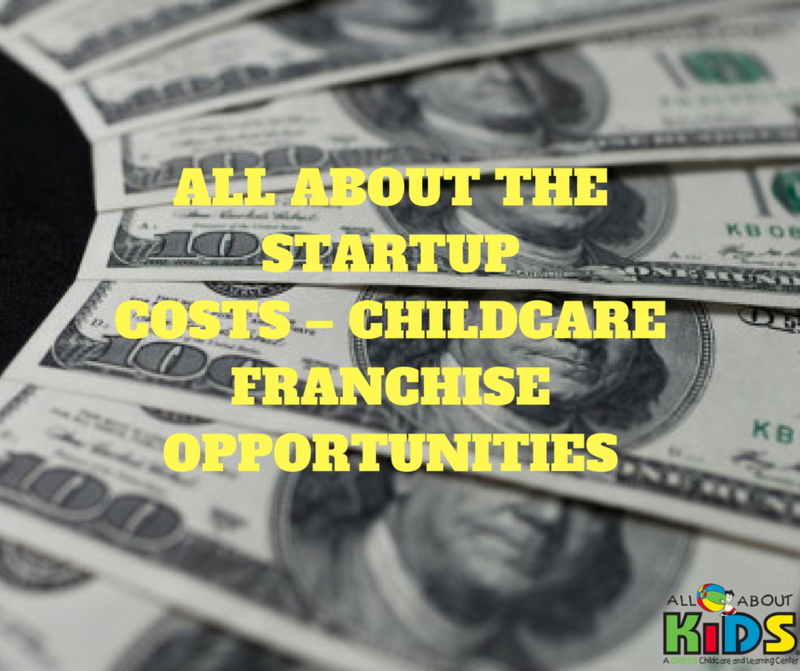 When you meet with an All About Kids franchisor and look at our FDD, you should be given a general idea of the Startup Cost. This should be the case with any childcare franchise, not just for Mason childcare facilities or All About Kids. As a general rule, you should always have at least 3-6 months’ worth of salaries saved up for your expected payroll in case of worst case scenarios. Whether you’ll be borrowing from family, an independent money lender, or have saved up all on your own, you should still have a tentative amount you’re willing to spend for your franchise startup—whether that’s what you have in the bank or a max amount overall depends on what your plans are and how you’ve gone about financing your childcare franchise. You should also be realistic about what costs you will have, maybe even make a list of your expected expenditure. Equipment like playgrounds, computers, etc. Note that these aren’t all of the costs for startup for a childcare franchise, but they are a great place to start your financial planning. If you want more insight into startup costs, feel free to ask your franchisor and even ask other franchisees what their startup bills looked like. Please let us know before you contact franchisees so we can give them warning ahead of time and they can set time aside for you. Running a Mason childcare center is a busy job and a call at the wrong time may warrant impatient or impolite responses if one is given at all. When you’re hiring for your childcare franchise, you’re probably thinking you want to hire the best of the best, however just starting out you may not be able to afford only hiring the most trained individuals that walk up to your door. Having a limited budget doesn’t mean you don’t want to hire quality people for your Mason childcare franchise, but you cannot hire a childcare professional at minimum wage. They most likely wouldn’t take the job. Remember that you’re paying for the skillset so if you’d like to hire a few more trained individuals and a few lesser trained to work underneath them, that’s a good method to stagger pay, provide mentors to the less experienced, and divvy out jobs that fit job skill to employ. Staggering the abilities of your staff can help your payroll in check during the first few months, especially as you just start bringing in money. When you put out advertisements for your positions, you will also have to think about what benefits you’re going to offer your employees, if any at all. When you’re thinking about employee benefits, remember to consult the law or ask your franchisor if they have any usual offerings. When you’re just starting your childcare franchise, it’s easy to want to build the biggest and best things that you can when it comes to equipment, playground, and toys. However to make sure you don’t run out of finances before you even open your childcare franchise, you have to keep your shopping list in check. A good way to think about it is that you’ll upgrade as you bring in new clients, bigger profits, and expand the abilities of your business relationships. While you don’t want to sacrifice safety or condition for price, you should be careful with your spending. Ask about business opportunities and discounts that your franchisor, like All About Kids, may have with suppliers. Your franchisor may have who may be able to give you a discount on new or used childcare center items.